There are a couple times of the year, when it is quiet here on the home front, and there is not a lot of gallivanting around, nor “wining and dining” as the old expression goes. While not a lot of fun for a Raconteur to develop new stories, there is always something going on. This is a busy time for my Bride with her employment, not to mention her volunteer programs and mentoring that she does, she is highly motivated, or just finding new ways to stay away from me (just kidding). Hence the reason for the house painting and a few more projects after the Easter weekend for me to start; and to keep her happy. Since I have been home with a project and basically eating in, I did have to find a few beverages to try, since in the evening I became the least likely bachelor. So I went into the cellar and retried some of the wines that we had purchased at two different wineries in Ohio, to see how they favored in a non-tasting room environment. 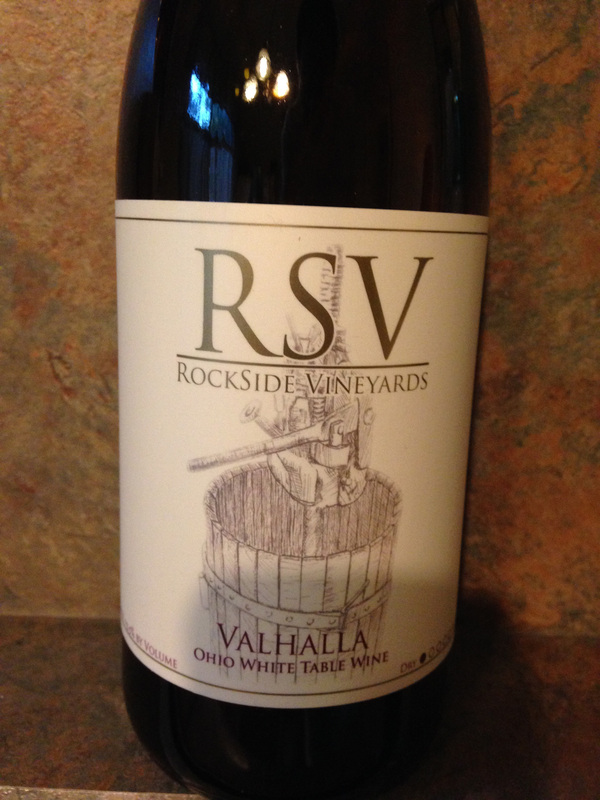 The first bottle that I opened was Rockside Vineyards Valhalla NV from Lancaster, Ohio. It was a fond memory visiting this winery as it looked like what I would imagine a small winery to look like. While the winery did some winemaking with the more classic varietal, they basically specialized in “Cold Hardy” wines like Niagara, Traminette, Vidal Blanc, Steuben, Chambourcin, Noiret and Chancellor. The wine is also “NV” or Non-Vintage since Central Ohio has no official appellation, they could not list a vintage year. The bottle of Valhalla did not offer any clues to what varietals were used and neither did their web site, but the wine was aged in oak and it was a “dry” white wine and it did pass the taste test of being enjoyable in a non-tasting room setting. I also tried another white wine during this period, as I was looking for refreshing after a day of toiling around the house. 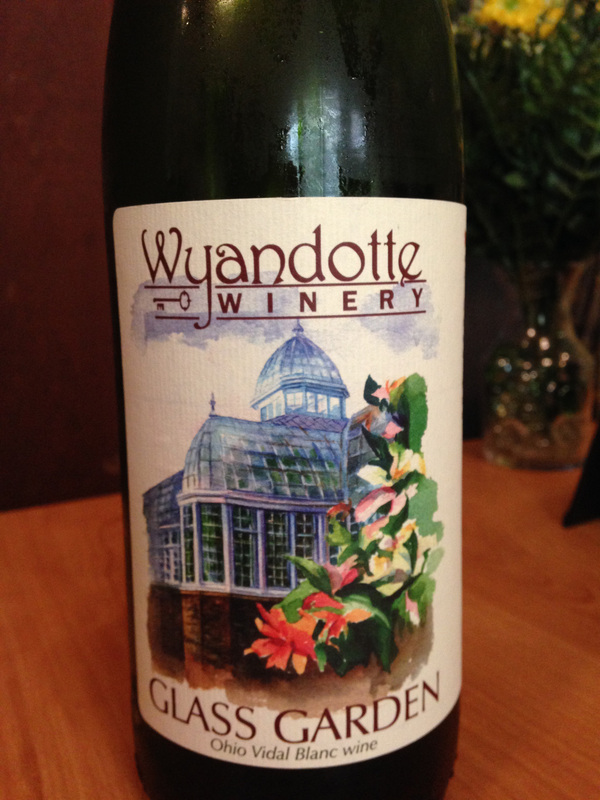 This time I opened a bottle of Wyandotte Glass Garden Ohio Vidal Blanc NV from Wyandotte Winery of Columbus, Ohio. The label pictures a portion of the Franklin Park Conservatory and Botanical Gardens of Columbus, which was based on the Glass Palace from the Chicago World’s Fair of 1893. The Vidal Blanc grape was developed by the French wine grape breeder Jean Louis Vidal and is a hybrid from the Ugni Blanc, famed for the grape production used to make Cognac and from another hybrid Rayon d’Or; the Vidal Blanc was developed to produce high sugar levels in cold climates with moderate to high acidity. While this wine was a bit sweeter than I usually enjoy, especially out on the town, it did work well with the fish and poultry dishes that I was having after each day of work around the house. This entry was posted in Wine and tagged Chambourcin, Chancellor, Cold Hardy, Niagara, Noiret, Ohio, Rayon d'Or, Rockside Vineyards, Steuben, Traminette, Ugni Blanc, Valhalla, Vidal Blanc, Wyandotte Winery. Bookmark the permalink.